This is the big one. 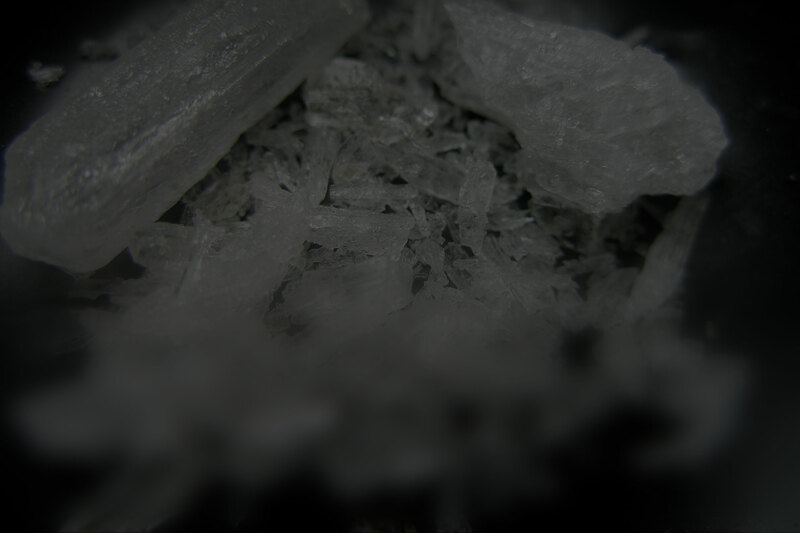 Few drugs are as destructive to the body and harmfully addictive as crystal meth. Meth is short for methamphetamine, which is a powerful central nervous system stimulant that interferes with normal neurotransmission. It’s made in a lab via complex chemistry processes and can be found in pill form, capsules, powder, and crystalized rocks. No matter how badass Walter looked in Breaking Bad, the reality is that meth is a dangerously addictive compound that causes long-lasting health problems if abused. Meth is the most addictive and destructive drug on the market. Athletes and students often start using meth because of the heightened physical and mental performance that comes from the stimulation of the nervous system. Laborers typically resort to methamphetamine to give them an added energy boost for long shifts. Used recreationally at raves and all-night parties, Meth is popular because it’s cheaper and more readily available than other stimulants like cocaine. Meth is popular because it’s cheap and easily accessible. Early signs of methamphetamine use include rapid eye movement, incessant talking, dilated pupils, anxiety, shakiness, paranoia, and decreased appetite. After continued meth use, a person may also develop more noticeable and debilitating symptoms, including nose bleeds, sever nail biting and anxiety, aggressive or violent behavior, a pale complexion or acne problems, compulsive picking at the skin or hair, and a sick, tired look. Meth may feel good as it lifts you up but it’s hell on the body, doing more damage in a shorter time span than any other chemical stimulant. Advanced stages of meth abuse will produce severe symptoms like mental illness, hair loss, discolored or rotting teeth, extreme weight loss, and corneal ulcerations. Talk about a sad state to be in. Meth is very serious. Not only does meth do incredible damage to the body, it also causes long-lasting changes in the brain, which can take years to fully recover from. If you know someone enslaved to this highly addictive and damaging substance, it’s important that you get them into a treatment facility immediately! The damages that methamphetamine abuse causes to the body are extreme and take more time to recover and heal than any other addiction. The most effective addiction treatment programs last at least three months and teach patients how to overcome cravings, as well as provide access to educational, vocational, and employment opportunities so the patients are able to re-integrate with society after recovery. Both individual and group therapy sessions are incorporated into most rehab programs. Admittance to a rehab program is absolutely essential to a recovery from meth addiction. Around 45 to 120 days into treatment, recovering addicts experience physiological changes that lead to intense drug cravings. The cravings for meth take longer to subside that the urges from other drugs. Learning to resist the relapse is the biggest part of meth addiction recovery. Meth recovery depends heavily on a support network of friends, loved ones, and peers who can offer understanding and structure for a healthy recovery. Willpower alone is often not enough to overpower the intense physical and psychological dependency of meth. If you or someone you care about is wrestling with a crystal meth addiction, remember that willpower alone is often not enough to overpower the intense physical and psychological dependency of meth. It’s essential to enter an addiction treatment program where you get the medical attention you need to weather the detox and the training to resist the near-magnetic pull the crystal will have on you for the next several years. Get treatment to overcome Meth forever. Learn to resist cravings and avoid a relapse. Weather the storm with others in recovery. Digging your way out of a meth addiction is a hellish, maddening process that requires great heart and strength. Those attributes come from a connection to other human beings. The #1 key to a successful recovery from methamphetamine dependency is a support group around you, people you can lean on when the times get tough and those little rocks are pulling you back in. There’s no shame in asking for help. Going through the intense physical side effects of withdrawal is an Olympian task that deserves congratulations for those who have made it through. However, the real battle begins when you step back out into the world, for now it’s up to you to stay clean and turn your life around. Avoiding relapse is nearly impossible on your own. That’s not to say there isn’t hope. Thousands of people recover from meth additions every day. It all comes down to the treatment and support network. The real battle begins after rehab, when you step back out into the world. As soon as you get back home, take some time to arrange your fresh start at life in a way that will not be conducive to slipping back into old habits or patterns. Meth addiction is a very serious medical problem that causes long-lasting damage to people, families, and communities. Change your friends. Avoid people who will tempt you back into a drug abuse cycle. Rely on a support group for recovering addicts. It’s inspiring to help others and share the burden together. Avoid triggers by engaging in new activities and recreations. Make a fresh commitment to your health with a proper diet and exercise routine. Remind yourself daily that a relapse is just a few steps away. Every day you must choose a clean, healthy, productive life. You know the alternative. Learn to fight the cravings or meth will eat away at your body and mind until it ruins your life. Meth production happens in "super labs"